Special 3, 6, 10, and 12 gallon models typically provide the same amount of recovery at each specific capacity as their basic counterparts except they include convenient features such as a power source switch between gas/electric, re-ignitor for relighting the pilot, electronic direct spark ignition(DSI), and/or motor-aided heat. Various gallon accommodations are available, and provided below are links of available models grouped according to features. Select electronically controlled water heaters are perfect for adverse weather conditions with its direct spark ignition(DSI) featuring a remote switch which can be used to conveniently light the water heater from inside your camper/RV! Heaters are porcelain-lined and feature an electrolytic action absorbing anode rod extending your heaters life for years to come. Whether the heater is 3, 6, 10, or 12 gallon it's no matter at 10.2 gallons it has the fastest recovery the industry has to offer providing more gallons of heated water for your pleasure. A heat retaining Copolymer jacket is fitted to keep the heat close, ensuring none escapes. Recover even more utilizing the 1,440 watt element with optional electric and gas water heaters that can recover up to 6 gallons per hour. On select models the Re-ignitor eliminates the need to relight your pilot keeping the heat recovery action consistent. Installation, operation, and maintenance are all easy as they are simple. 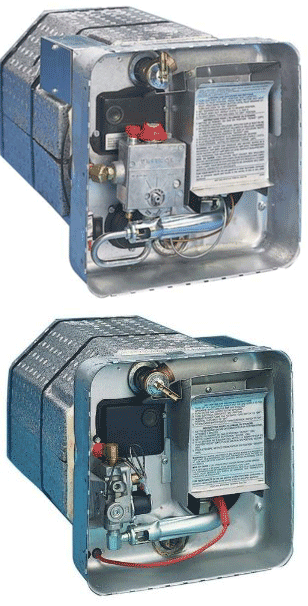 Basic Models have to be manually lit from outside the camper/RV and require LP gas. S/D models are scratched or dented or possibly a combination of both. These function just as good as a new product would except they are discounted since some minor cosmetic damage is present. They are extensively tested to ensure quality. The re-ignitor is used for relighting the pilot in the event it goes out. As mentioned above, select models include an optional electric source to switch to for increased versatility. This allows for another primary energy source and serves as a back-up when you need it. Other models may include a DSI feature or direct spark ignition. This allows you to remotely ignite the pilot from inside your camper/RV which can save time, requires very little effort and helps to avoid poor weather conditions. Suburban Heaters w/ Direct Spark Ignition(DSI) & Motor-Aid Hrt. Finally, a feature known as motor-aid heat allows engine heat to warm water via an exchanger making it an efficient green option that results in saving money. 3 gallon water heater features 9,000 BTUs and is 12-11/16"H x 12-11/16"W x 16-1/8”D. Cutout size: 12-3/4"H x 12-3/4"W.
6 gallon water heater features 12000 BTU's andis 12-11/16" H x 12-11/16" W x 19-3/16" D.
10 gallon water heater features 12,000 BTUs. Unit Size: 16-7/32"H x 16-7/32"W x 20-1/2"D. Cut-out size 16-7/32"H x 16-7/32"W x 20-1/2"D.
12 gallon water heater features 12,000 BTUs and is 16-7/32"H x 16-7/32"W x 22-1/4”D. Looking for Atwood Water Heaters? Copyright © 2010 suburban water heater. All rights reserved.